The Omega 8002 juicer is an upgraded version from the Omega 8001 juicer, so you will see a lot of similar features if you compare the reviews for these models. Some people will find the upgrades on this model worth the extra expense while others decide the older model is the better pick for their needs. Before you make this decision read the reviews for both models and consider that this model sells for just a slightly higher price. Let’s take a peak at the strengths and weaknesses of this model so you see what you get for that small upgrade in price. Two stage juicing process delivers more juice in every batch. Grinds, homogenizes, and minces as well as juicing. 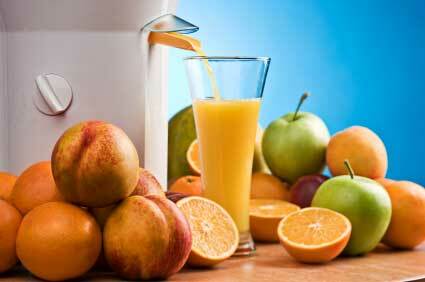 Slow speed keeps a higher concentration of vitamins and minerals in the juice. FDA approved materials for safety and health. Works well with wheatgrass and other fine leafy vegetables. Reverse design cuts down on clogging. Highly durable for a very long life span. The biggest strength of this juicer is the basic design. It is a slow turning masticating juicer which eliminates the heat build up and foaming that reduces the quality of juice produced by other types of juicers. Less heat and foaming and drier pulp means you will have more nutrients in your juice…which means you will enjoy healthier juice and a better yield for your money. These strengths can be found with most masticating juicers, but what really makes the Omega 8002 a great product is the high quality parts and durability of the machine. You can expect this juicer to be sitting on your counter throughout the years, quietly churning out fresh juice and helping you chop and dice in preparation for meals. 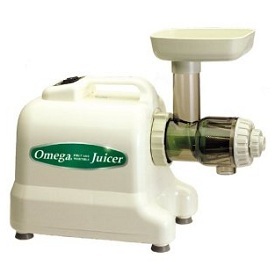 Finally, the powerful motor is a great feature that you will find with most Omega masticating juicers. Smaller sized chute requires more prep time. May be slower to process than some like. It must be noted that these complaints are only pointed out by a small fraction of reviewers and those who state these negative aspects still give the machine an overall great review and very high rating. The slower speed of the machine is what actually avoids the heat build up and the foaming which reduces quality of juice from other types of juicers. You just have to accept that the process will be a bit slower when purchasing a more efficient masticating juicer. The Omega 8002 juicer is a great buy, but you may want to compare it with other Omega masticating juicers before you make a final decision. The fact that you will be hard pressed to find a completely negative review of this model should tell you something about its quality.